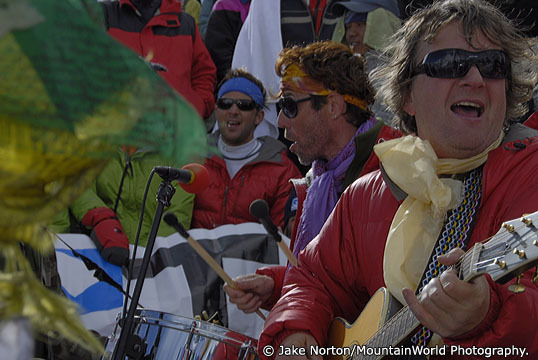 Highest concert in the world…Everest ROCKS!! 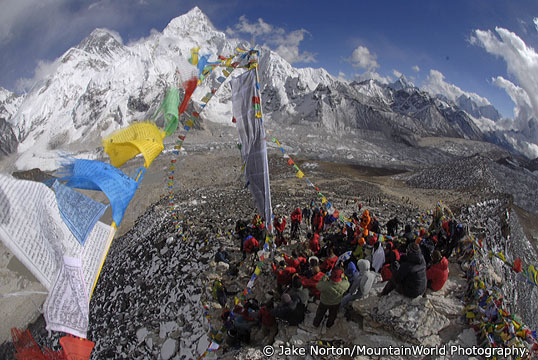 Home / The MountainWorld Blog by Jake Norton / Highest concert in the world…Everest ROCKS!! 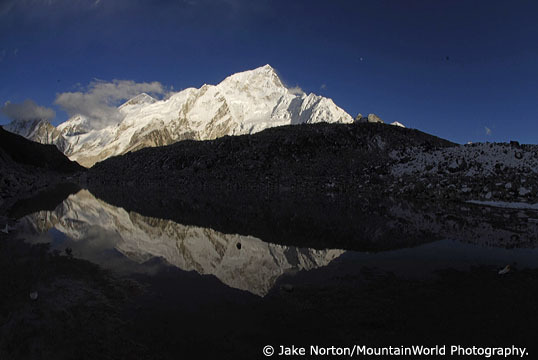 I am sitting in the shadow of Nuptse in the small village of Gorak Shep at 17,000 feet in the Khumbu Valley of Nepal. Our team is quite happy after an incredibly successful time on Kala Pattar yesterday afternoon. Since my last message from Namche Bazaar, we had several days of wonderful trekking up the Khumbu Valley, stopping in Pangboche, Dingboche, and Lobuche before finally reaching Gorak Shep and Kala Pattar. There are far too many highlights to cover all of them here, but one of the tops was having a private audience with the high lama of Thyangboche Monastery – the spiritual heart of the Khumbu – and watching Mike, Cy, Glenn, Jaime, Nick, and Slim belt out "Give Me Love" with all the passion and emotion the song and moment deserved. There have been musical interludes along nearly every step of the path to Gorak Shep, all of them emotional, touching, and unique. But, the highlight of them all came yesterday afternoon as our team trekked from Lobuche at 16,000 feet up the lateral morraine of the Khumbu Glacier to Gorak Shep. After a quick lunch in this tough, high-altitude place, we continued upward to the tip-top of Kala Pattar. Wind and cold notwithstanding, we set up mic stands, plugged in guitars and Slim’s stand-up snare and the highest concert in the world began with a crowd of about 70 people. We all sat (well, many of us did, although Damien, Stosh, Alex, and I were pretty busy capturing the moments on film) under the watchful eye of Everest as the gang sang amazing songs. I was more than impressed by their stamina and tenacity and ability to play music at 18,536 feet in 25-30 mph winds, but play they did for about 30 minutes. It was an amazing, emotional time, and quite a joy to see the dreams of Mike Peters and James Chippendale (and indeed all 37 of us) come to fruition. Tomorrow, we head down valley to Pheriche and in 4 days time will be back in Kathmandu preparing for the finale concert in Kathmandu’s Durbar Square. There, the stage will be shared with several Nepali bands. It should be another amazing time in what has become a long string of emotional, moving, and impactful moments. And, most importantly, Everest Rocks has succeeded in its mission of raising needed funds for the Bhaktapur Cancer Relief Hospital. Great to be a part of a team with a higher mission than the mountains. As I opened my morning newpaper here (The Melbourne Age) I saw one of your photo’s inside of these muso’s at base camp. Good to see the bloke from UK Squeeze there. Who could ever forget ‘Cool for cats’…..
‘To change the mood a little, I’ve been posing down the pub, I see from my reflection I’m looking slightly rough…..”. You must be famous now, if one of your photo’s appears in the Age newspaper here!. We are trying to get in touch with you regarding your talk at our conference on the 28th. Request you to get in touch with us on rajankalia@yahoo.com or speak to my colleague Rajan Kalia in room number 254 at Soaltee Crowne Plaza at Kathmandu, he will be in the room after 10.00 pm today 23rd October 2007. A word from you today will be highly appreciated. Alternatively please send us your contact details and we will get in touch with you. What an amazing journey Jake….. I need to know the team that produced your sucessful concert. We will need thier services for our show next year. Leave a Reply to Michael Dogor Click here to cancel reply.